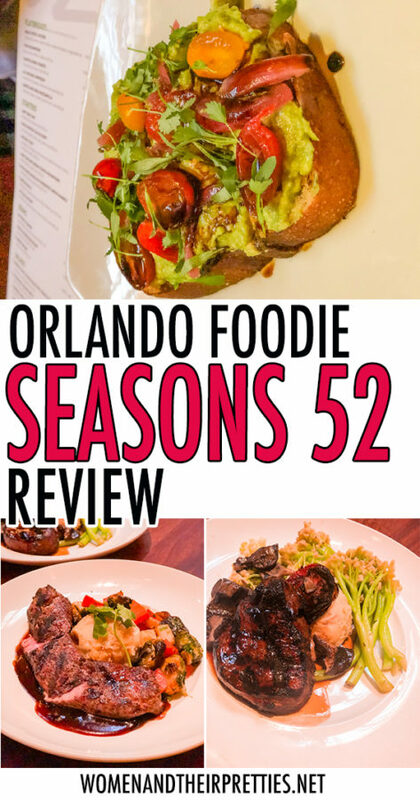 I had the pleasure of being hosted at the Seasons 52 Altamonte Springs restaurant this past weekend to try their Valentine’s Day specials and a few of their best dishes. 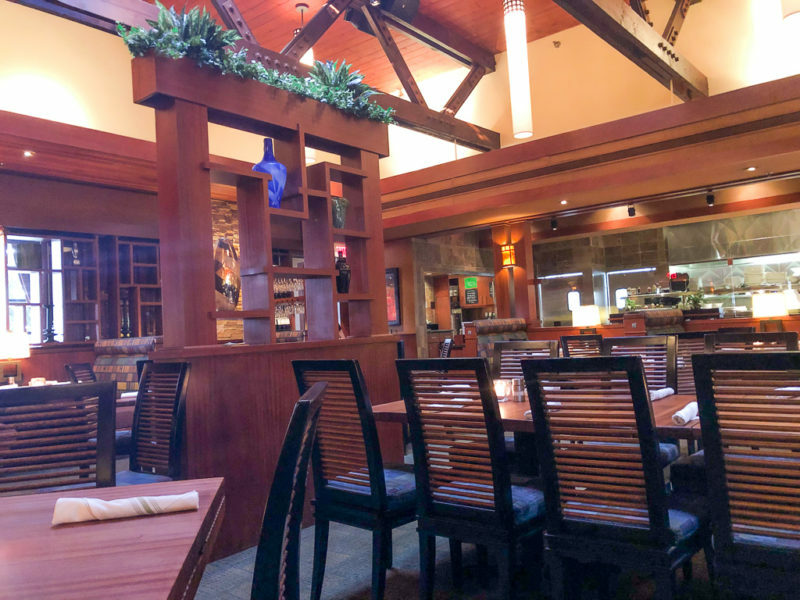 This was my first experience at a Seasons 52 restaurant and I was pleasantly surprised by the quality of food, welcoming atmosphere, and friendliness of the staff. 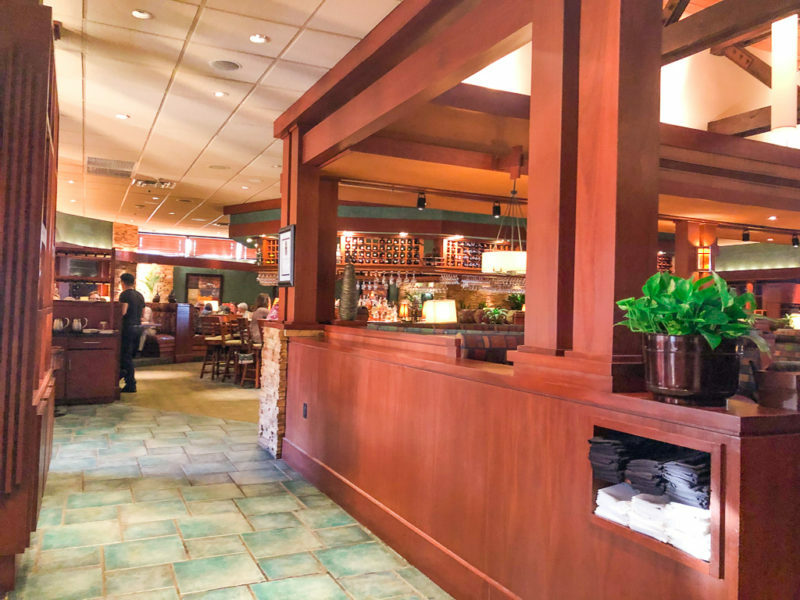 Seasons 52 in Altamonte Springs, FL is a beautiful restaurant. Every inch of the restaurant is pristine. I really appreciate the uniqueness of the open kitchen and the reasonable prices of the dishes. 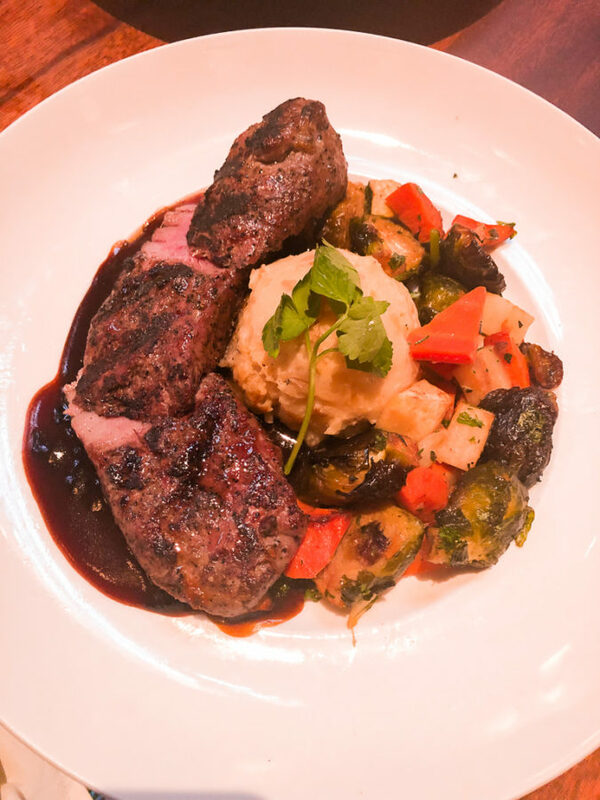 It’s not every day that you get filet mignon for under $30! In addition to the great prices, I love the menu selections. 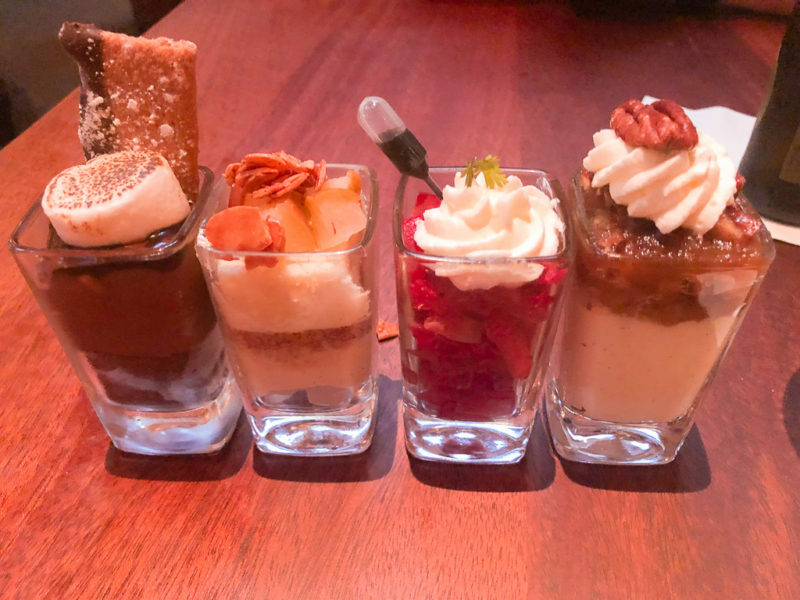 With a variety of fresh flatbreads, mouthwatering entrees, and delectable desserts, it’s hard not to order a little bit of everything; which is exactly what we did. 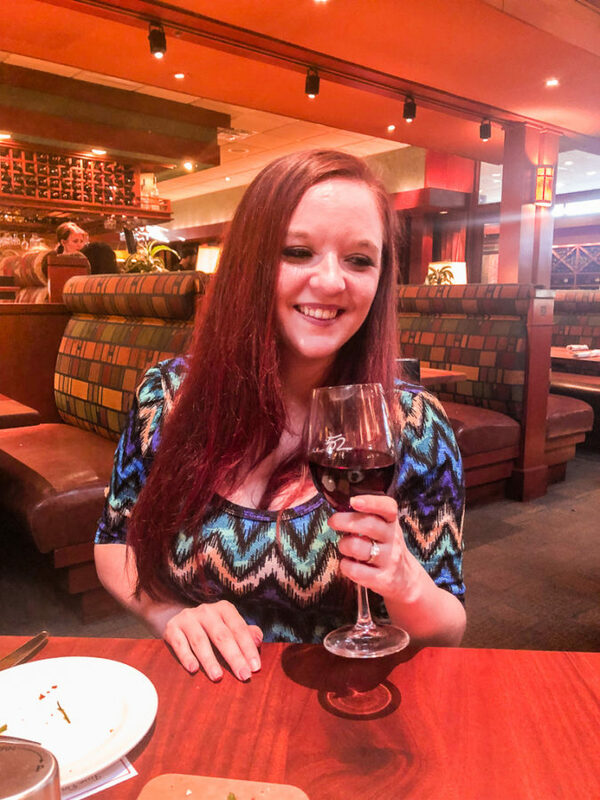 We started off with alcoholic beverages because when it’s date night, my husband and I like to get a little saucy. I’m kidding. 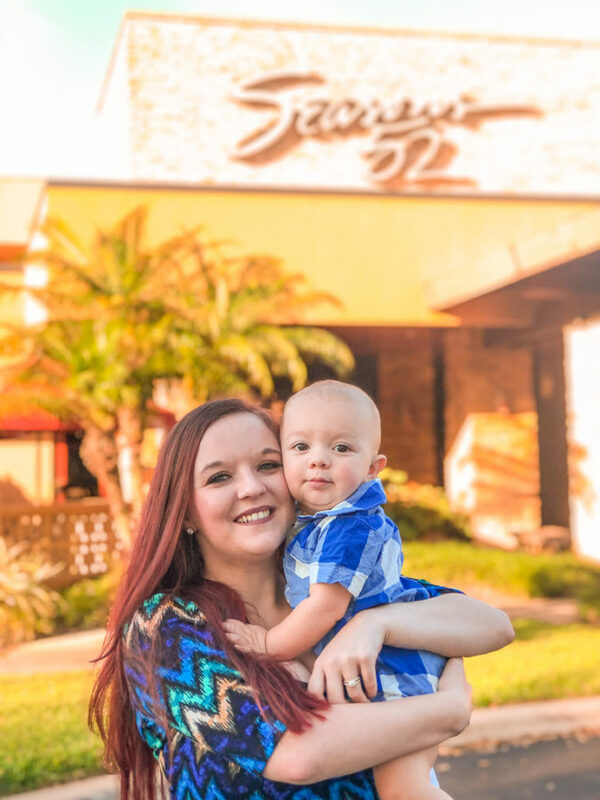 We typically only drink on special occasions or when dining at a nice restaurant. Since we were celebrating Valentine’s Day at this lovely Orlando-area restaurant, we’s enjoy a little something. My husband ordered a New Old Fashioned and I ordered the Loveblock Pinot Noir. I’m not typically a red wine drinker but I thought I’d try it out with the Garlic Pesto Chicken Flatbread. 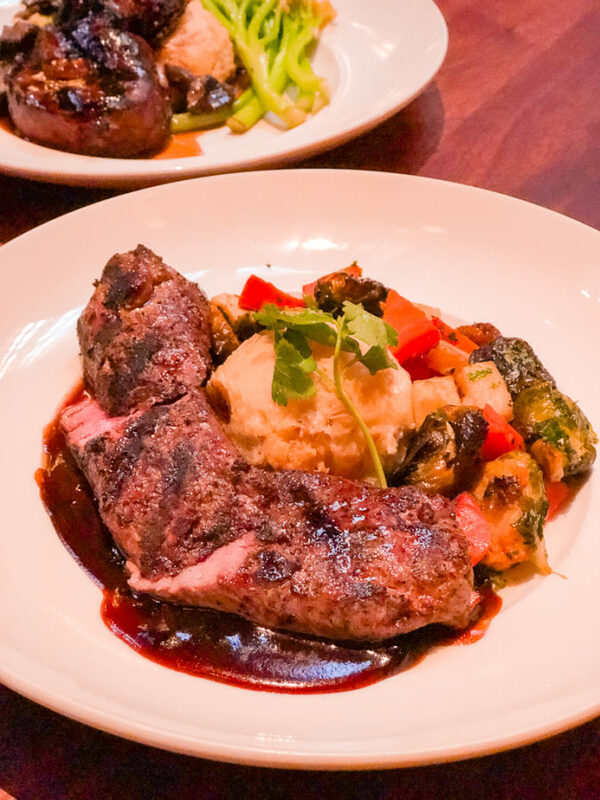 This combination is the Day 2 Valentine’s Day deal of the 5 Days of Valentine’s at Seasons 52. 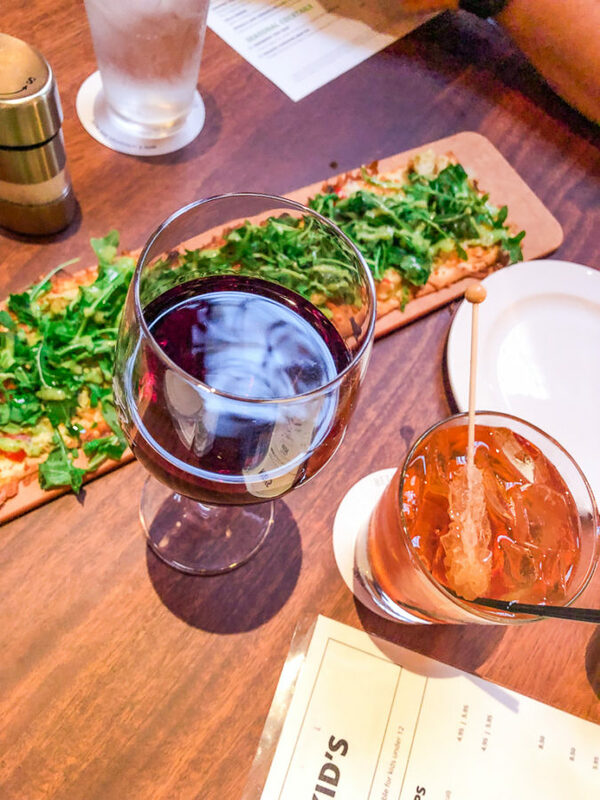 You get a glass of Loveblock Pinot Noir and a flatbread of your choice for $15! 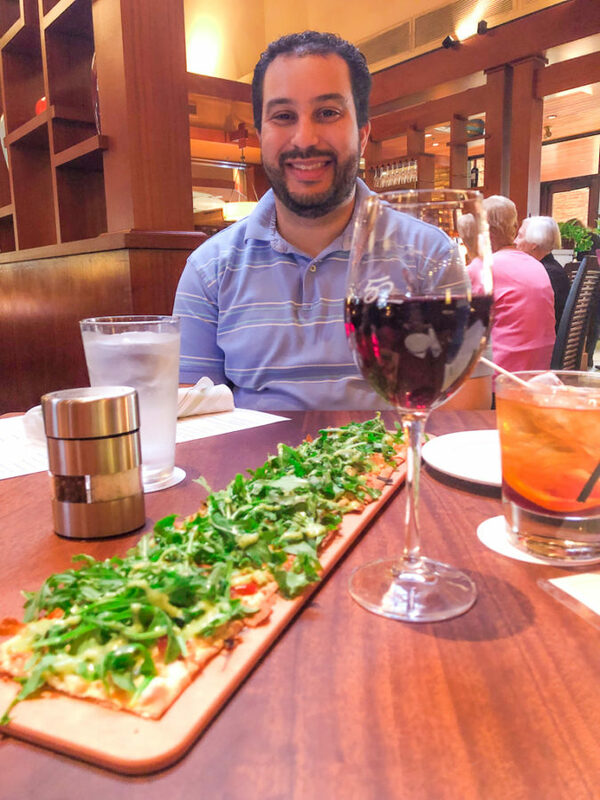 The Seasons 52 flatbread is absolutely delicious. There’s no denying the freshness of the arugula and the carefully chosen ingredients. It’s basically a masterpiece of a dish. 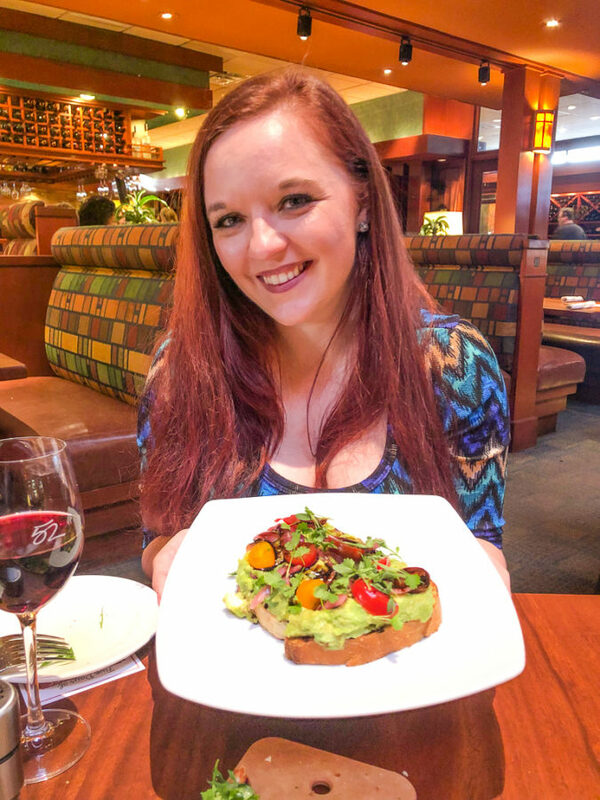 We also ordered the Avocado Toast because, why not? You say avocado and we all say YES! This particular avocado toast was on thick, wood-grilled sourdough bread. You can taste the wood-grilled flavor. 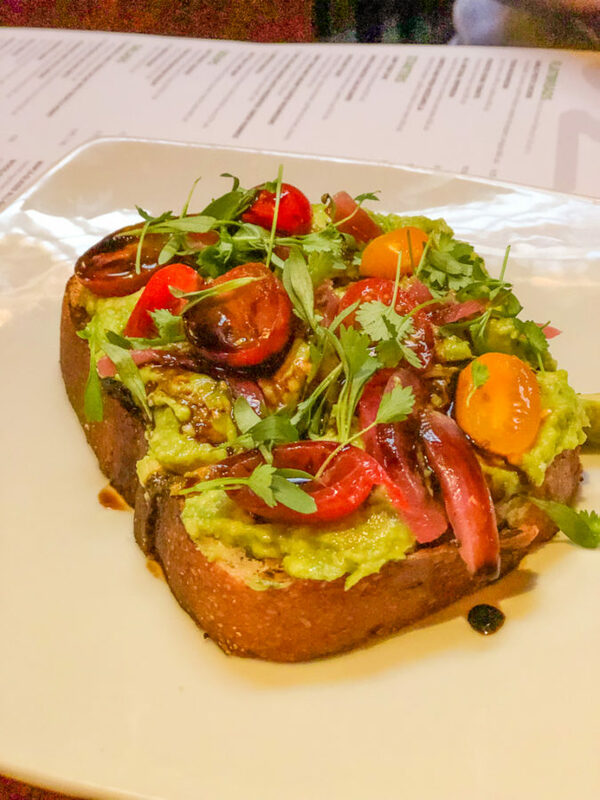 That flavor, paried with the red pickled onion, tomatoes, cilantro, and 15-year aged balsamic makes for a starter that you wont want to miss! Honestly, I had a hard time sharing. As for our entrees, my husband ordered the Wood-Grilled Filet Mignon and I ordered the Kona-Crusted Lamb Loin. 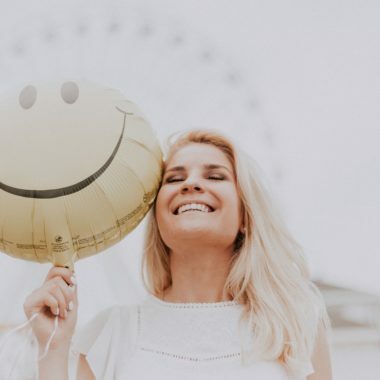 My husband and I think alike when it comes to entrees: If there’s filet mignon or lamb – we’re absolutely ordering it because you can’t get it just anywhere. 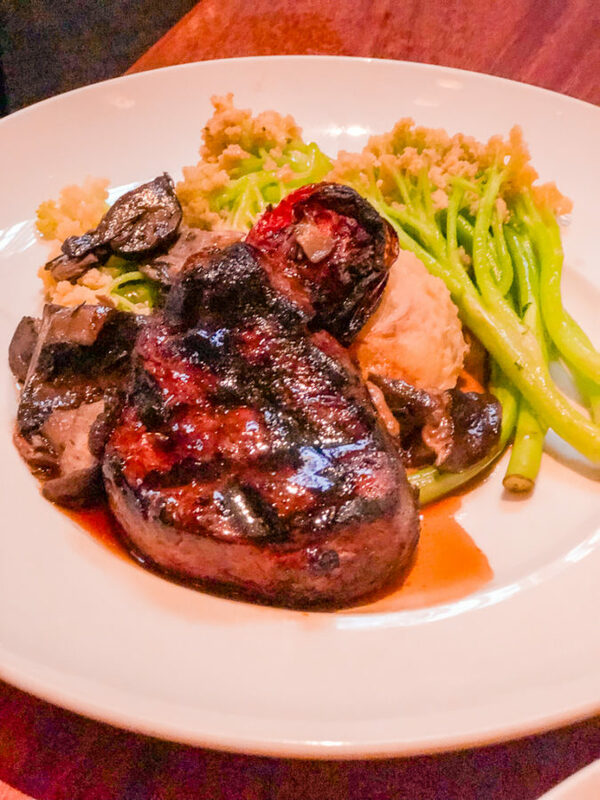 The Filet Mignon was so tender and flavorful that my husband couldn’t stop rolling his eyes back as he enjoyed it. 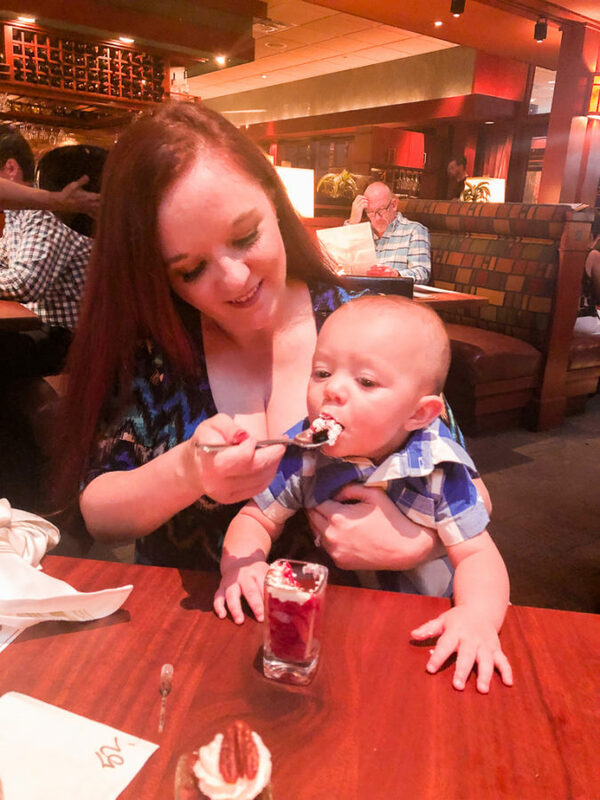 He specifically loved the portion sizes – not too much, not too little. It’s like the story of Goldilocks and The Three Bears – it was just right. Typically my husband orders the better dish when we visit restaurants but not this time. The lamb was everything I wanted it to be. It was tender, juicy, and had a flavor that I can only describe as perfection. 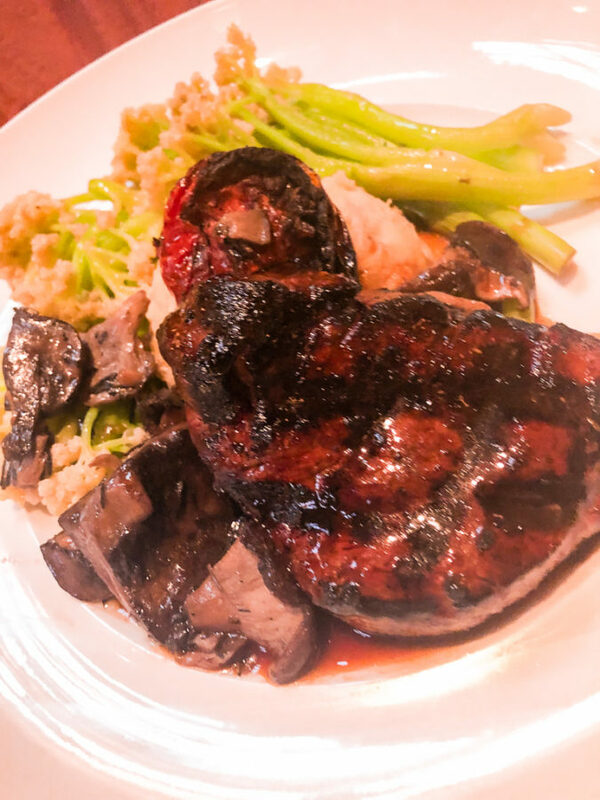 I think the balsamic demi-glace is what really did it for me. I wiped my plate clean, with the help of my little one who got to try mashed potatoes for the first time. 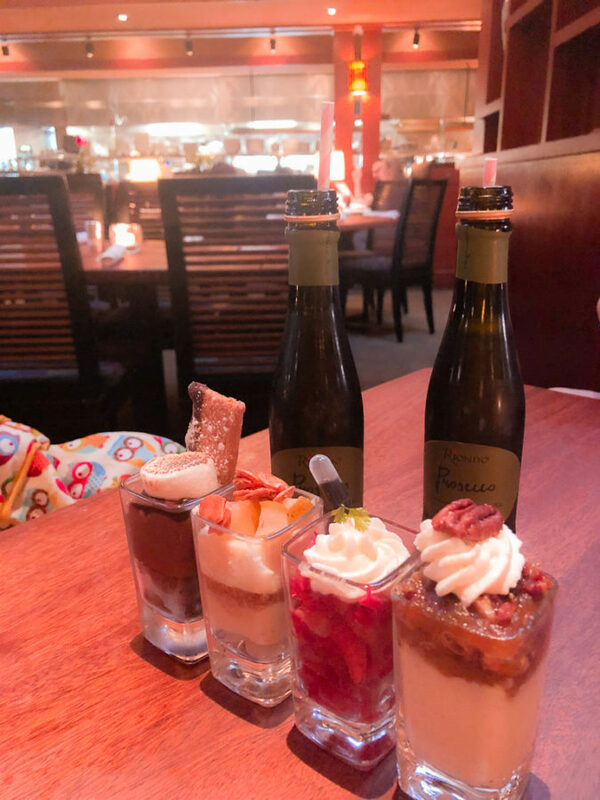 We finished up our entrees with just enough room for dessert. 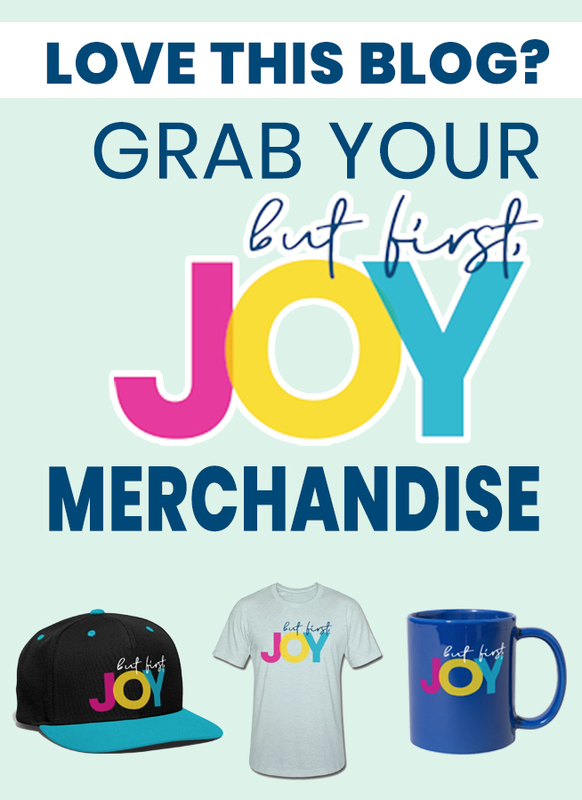 Except, we got a little more than that! 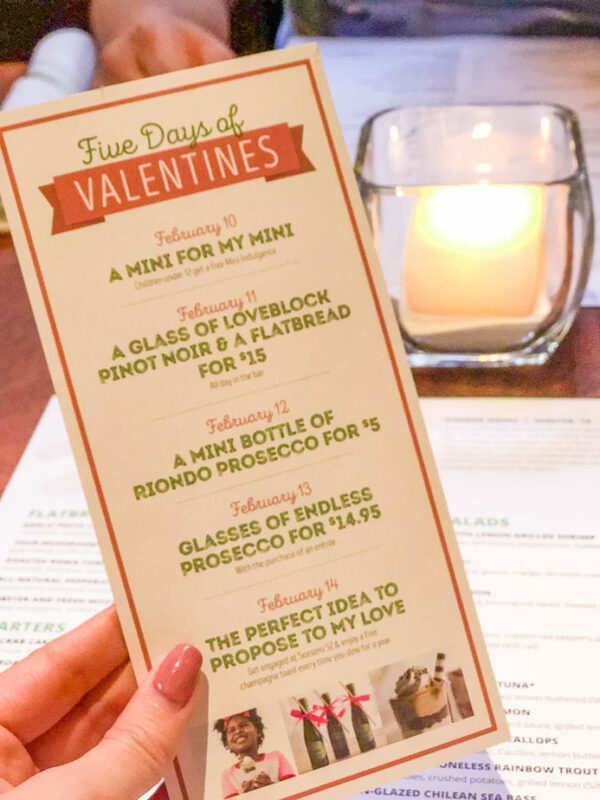 We had the pleasure of trying Day 3 of Seasons 52 Valentine’s Day deals which is a mini bottle of Prosecco each. This was presented with a mini bottle and a pink striped straw. 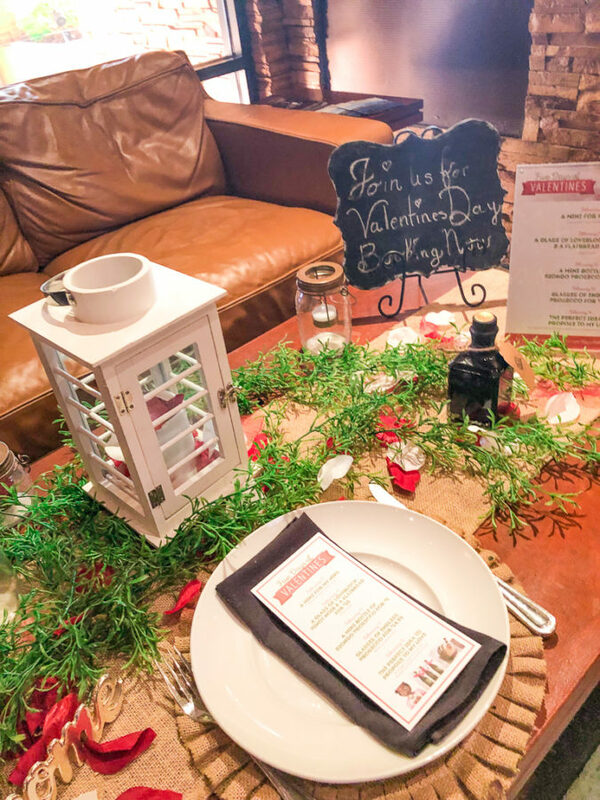 I absolutely adored this fun little touch and thought it was perfect for Valentine’s Day. We were offered a glass to drink the Prosecco in, if we preferred, but I liked the idea of drinking from a cute straw out of the mini bottle! 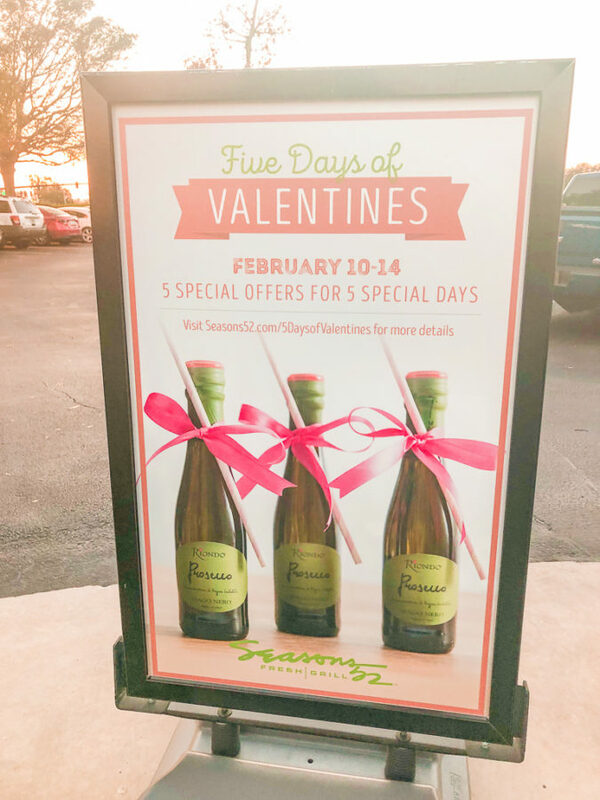 This deal is only $5 for Day 3, Tuesday February 12th, at a Seasons 52 near you! Finally, we got to enjoy the Day 1 deal which includes, you guessed it, dessert! 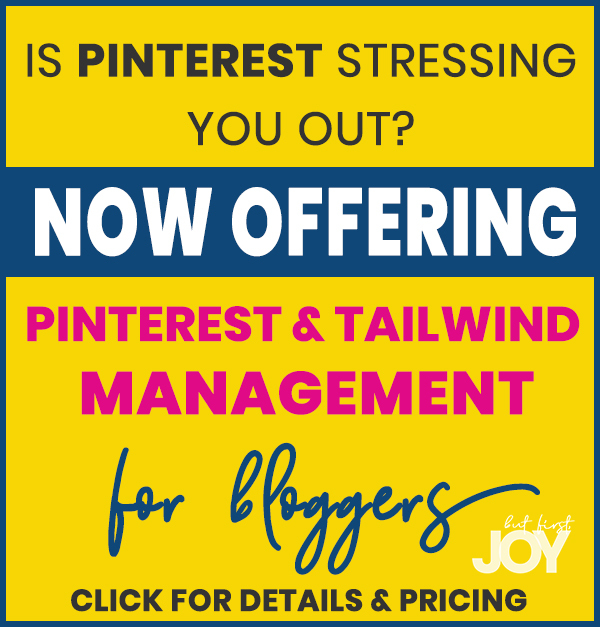 You may have seen me post about this deal on my Instagram Monday. 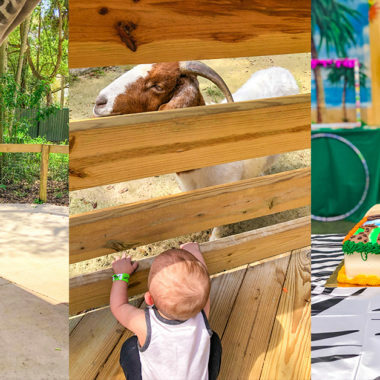 Children under 12 got a free mini indulgence! 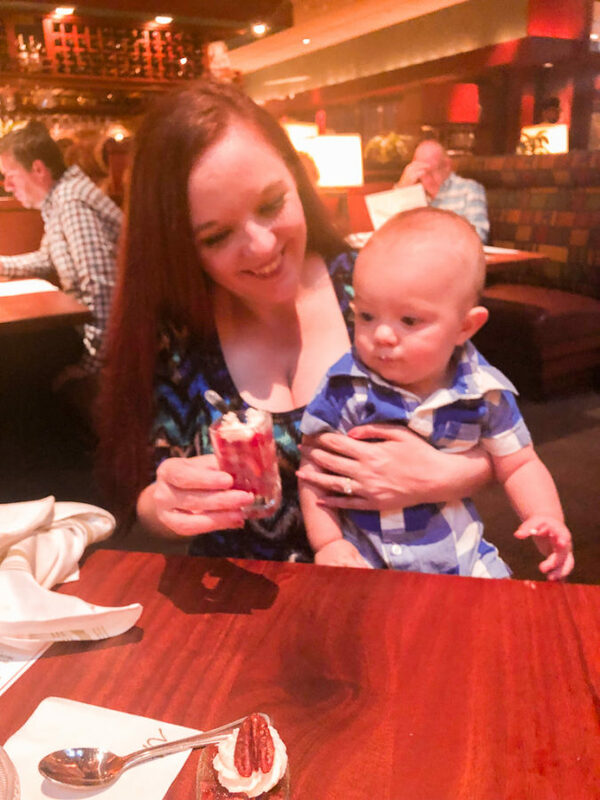 My mini and I had the pleasure of sharing some of these mini indulgences! 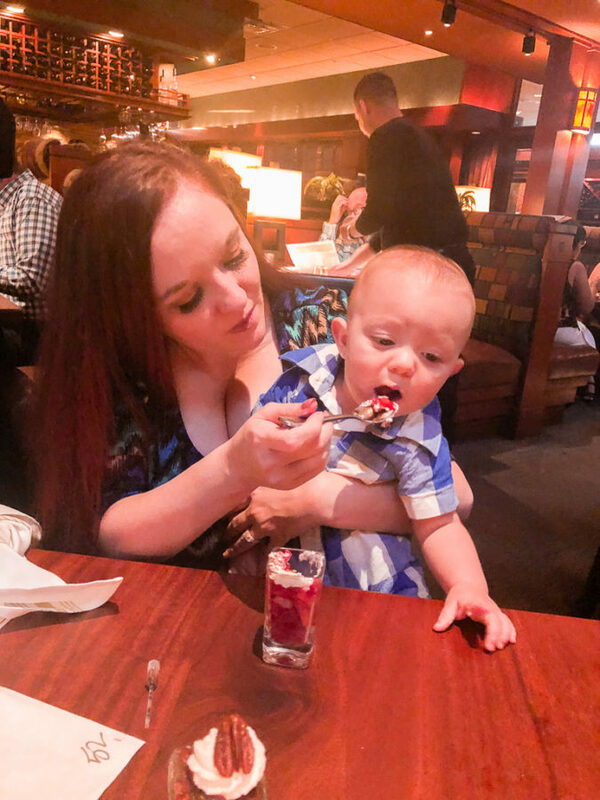 He personally loved the chopped Strawberries with Balsamic and whipped cream. I loved the Belgian Chocolate S’More, and my husband literally couldn’t stop talking about the Pecan Pie. 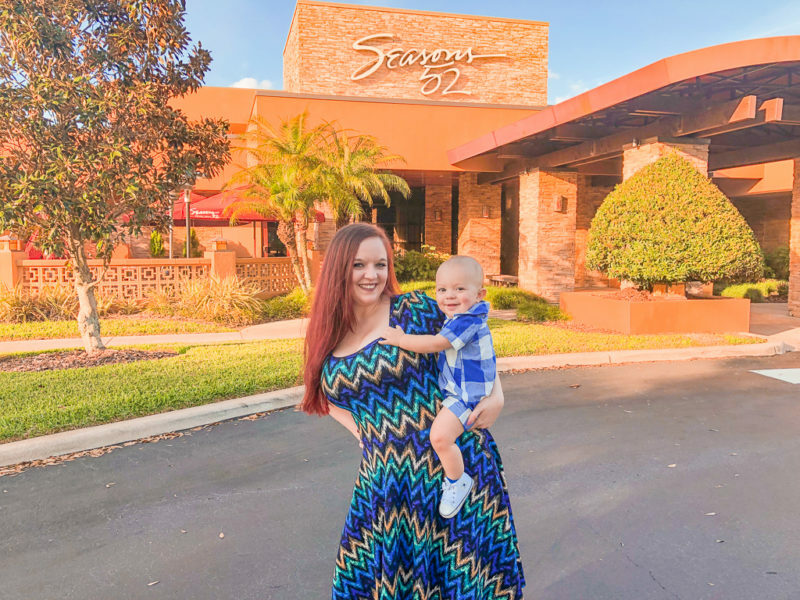 Overall, we had an incredible experience at the Seasons 52 in Altamonte Spring, FL. The price was right, staff was delightful, and the food was crave-worthy! 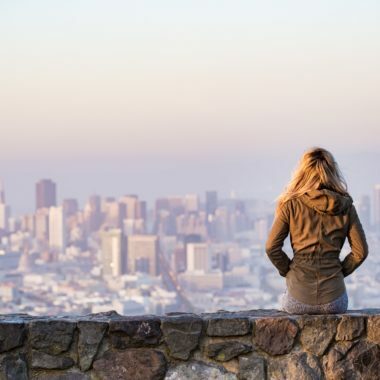 We will definitely be visiting this location often!